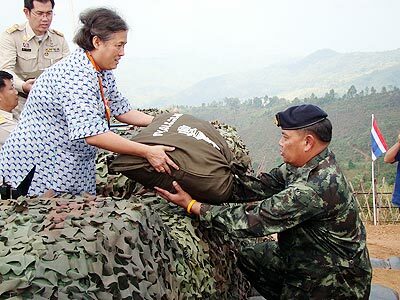 HRH Princess Maha Chakri Sirindhorn presented survival kits to the members of the Pha Muang Task Force on her visit to the military base at Ban Poona in Mae Fah Luang, Chiang Rai on January 15, she was greeted by the Commander of the Task Force, Major General Prakarn Chonlayuth on her arrival. Ajarn Em-Orn Tongbai, Director, and John Allen, Headmaster of the Foreign Department at Nakorn Payap International School welcomed 150 teachers and administrators from Ubon Ratchathani and Tak Provinces schools to a conference teaching management processes, academic and curriculum development and teaching/learning systems hosted by the school on January 14 and 15. 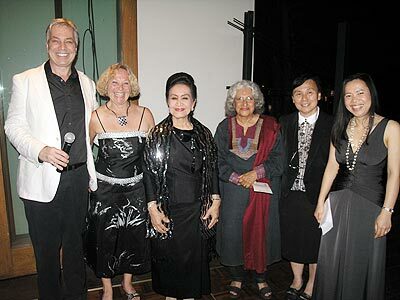 Chalinee (Jennifer) Sunkham, right, PR & Event Executive, and a staff member of the Oasis Spa, Chiang Mai, Thailand, present a New Year’s gift to Phitsanu Thepthong, Editor of Chiang Mai Mail at the newspaper’s office during the New Year.